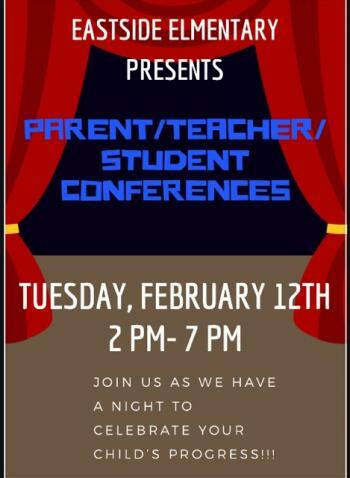 We are looking forward to welcoming all parents and families to Eastside this Tuesday, February 12 for our Spring conferences. In order to have enough time to share all the great things happening in your student’s classes, we will have early dismissal that day at 1:30. Students will share their amazing growth and successes from the last meeting in October as well as their goals and areas they are working to improve. Students will be shareing work samples and goals from their student data notebooks as well as some favorite learning moments. Teachers will of course be available to answer any questions and give information, but we are thrilled with the ownership our students are taking in their learning. We look forward to seeing everyone out on Tuesday night!